Today was Day #4 of Chocolate and Holiday Spirits Theme Week. 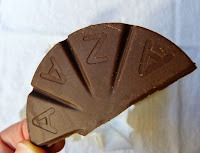 Taza Chocolate's Chocolate Mexicano Disc line included many different flavors. 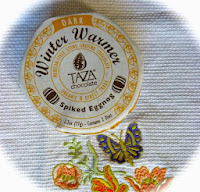 A seasonal favorite, the Dark Chocolate (55% Dominican cacao) Spiked Eggnog offering, blended stoneground chocolate with eggnog flavors (essence of rum, spices) for a holiday twist on a cold weather favorite. The Eggnog was labeled as a "Winter Warmer" flavor. 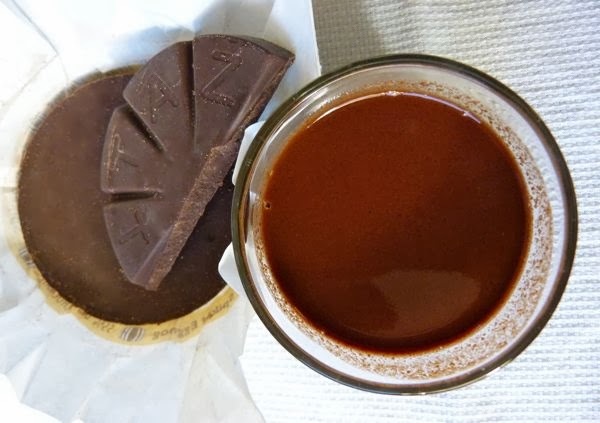 Break off the desired number of chocolate wedges; and stir them into a small mug of very hot water until they're fully dissolved. Or you could add some hot milk and grate some fresh nutmeg over the top. Either way, these wedges make an authentic-tasting, flavorful drinking chocolate.